West Virginia’s teacher strike started over pay and benefits. But it could end up transforming the state's politics. 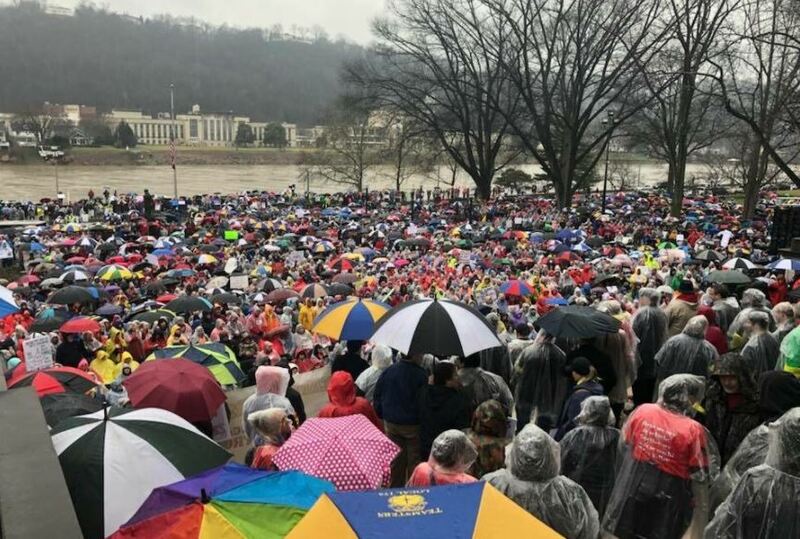 Thousands of West Virginia teachers and school service personnel have flooded the state capitol every day since February 22, demanding higher pay and more funding for the state’s struggling public employee health care system. This is West Virginia’s first-ever statewide teacher and school service personnel strike and the only one since 1990. In less than two months, the movement has grown from a couple hundred angry teachers and school service personnel demonstrating at the capitol to a full-blown strike. It has seemingly caught everyone — from union leaders to state legislators to the rest of the country — by surprise. Things seemed ordinary enough a few months ago. Last November and December, the Public Employee Insurance Agency (PEIA) Board held hearings, as it does annually, on its proposed changes for the upcoming fiscal year. PEIA’s health insurance plans cover one in seven West Virginians, including teachers. Given insufficient funding to keep pace with rising health care costs, the board proposed more cuts. Public employees turned out to the PEIA hearings to oppose the cuts. But this year, they didn’t stop there. They began to organize and connect, through Facebook, across the state. The on-the-ground organizing started small. In December, teachers attended a legislative committee hearing on PEIA, and a video of the committee chair rudely dismissing an angry teacher after the hearing was shared over 350 times on Facebook. In early January, a small group of public employees held up a banner reading “Public Employee Healthcare, NOT Corporate Welfare” at the governor’s State of the State address. The governor’s offer of a 1 percent raise for public employees seemed to backfire, as a couple hundred teachers rallying the following Monday derided the proposal as too little, too late. A secret public employees Facebook group that numbered just a couple hundred members at the start of December grew to nearly 24,000 members by mid-February. The group became a place for teachers, school service personnel, and other public employees to share information about PEIA, to post responses from state legislators to their letters — and to remind each other what they had won in the 1990 teacher strike. The teachers’ and service personnel’s cause was taken up early by state Senator Richard Ojeda, a populist Democrat from Logan County, one of the poorest in the state. Senator Ojeda introduced a bill to raise the natural gas severance tax to provide a dedicated revenue stream for PEIA – offering a stark contrast to Republican leadership, which insisted that the state economy was simply too weak to find the money for public employees. In January the state teachers’ unions — AFT West Virginia and the West Virginia Education Association — announced a rally for February 17. By the time that day arrived, there had already been walkouts in ten counties. The first to stage one-day walkouts, on February 2, were the southern coalfield counties of Mingo, Logan, and Wyoming — areas with some of the poorest school systems in the state and also deep historical roots of violent labor struggle. On February 16, teachers and service personnel staged walkouts in seven counties around the state and flooded the capitol. The next day’s rally on February 17 drew ten thousand teachers and public employees from all over the state. Union leaders announced a two-day, statewide walkout starting a few days later. County school boards across the state voted to close schools during the walkout, standing with teachers and school service personnel by essentially treating the walkouts as snow days that would be made up later in the year without employees losing pay. Students at Charleston’s Capital High School launched the social media campaign #SecureOurFuture, organizing students across the state to wear purple in solidarity with the teachers the day before the walkout. Two days before the walkout, the PEIA Board voted to “freeze” PEIA for the next fiscal year, that is, not enact the cuts it had previously planned. This resulted in a $29 million hole in PEIA’s budget which the legislature has yet to figure out how to fill. Legislators are looking at the easy fix of taking money from the state’s Rainy Day fund, which would be a one-time fix that would kick the PEIA cuts to the subsequent fiscal year, not permanently avert them. The day before the walkout, the legislature passed a bill to give a 2 percent pay raise to teachers, school service personnel, and state police, followed by a 1 percent raise the following year (and an additional 1 percent just for teachers in the third year). These concessions were not enough for teachers and service personnel. A 2 percent raise for school service personnel would be an average of $550 a year, not even enough to make up for the higher health care costs incurred over the last few years. And a one-time “freeze” for PEIA would not reverse the cuts of the past few years, nor solve the ongoing problem of insufficient revenue to keep up with increasing health care costs. On the second day of the walkout, the state teachers and service personnel unions held a press conference to announce that teachers and service personnel would not be going back to work on Monday and would stay out until the state legislature met their demands of a meaningful pay raise and a fix for PEIA. With less than two weeks left in the state legislative session, that is where things stand today. Although the strike’s rapid spread caught those in power — both in the unions and the legislature — off-guard, the movement clearly tapped into simmering anger on the part of West Virginia’s public employees. The conditions leading to this moment have been building for several years. The Public Employee Insurance Agency (PEIA) has been cutting benefits in the face of rising health care costs. In the last three years, for someone making the salary of an average West Virginia school service employee ($27,500 a year), the annual PEIA family plan deductible has more than doubled and premiums have increased by $336 a year. For the average teacher, premiums have risen $348 a year, deductibles by $400, and the out-of-pocket maximum by $2,000. That’s on top higher co-pays for prescription drugs, general and specialist doctor visits, and cuts to other benefits. In other words, teachers, service personnel, and other state employees are paying hundreds of dollars more each year in health care costs than they were a few years ago. Meanwhile, teacher pay ranks forty-eighth in the country. Teachers and school service personnel earn salary increases with each additional year that they teach — but at 1.1 percent to 1.8 percent per year, those step increases do not even keep up with inflation. And though most media attention has focused on teachers, the strike’s appeal is more widespread. With one in seven West Virginians on PEIA, everyone knows someone with a stake in fixing the state’s public employee health insurance plan. A wildcat teachers’ strike may not fit into current perceptions of West Virginia, but this action is very consistent with the state’s militant labor history – and with the more recent failure of Democratic Party politics in West Virginia to address working-class interests. The state Democratic Party in West Virginia has virtually collapsed over the last few years, and now occupies only a third of the seats in the legislature after holding majorities for over eighty years (1932 – 2014). The state Democratic Party’s internal contradiction of being both the party of coal and the party of the working class became increasingly untenable with the decline of industrial unionism and the rise of Third Way Democratic Party neoliberalism on the national stage. Over the past few decades, more and more West Virginians have lost faith in the Democratic Party, defecting to become independents. In 1996, 63 percent of West Virginia voters were registered Democrat, 30 percent Republican, and 7 percent independent. Twenty years later, in 2016, only 45 percent of voters were registered Democrat, with independents growing to 21 percent. The 2016 presidential election results — in which Trump carried the state with 68 percent of the vote, but Sanders beat Clinton in every county in the Democratic primary — suggests that voters don’t feel represented by the mainstream of either party. Voters perceived that the state Democratic Party was not doing much for working-class interests. And while many teachers today rightly fault the Republican majority for failing to take action on teacher pay and PEIA during this year’s legislative session, it’s hard to argue that the Democratic Party fought hard for teachers when it held the majority. Indeed, despite being the majority party for eighty years, Democrats never granted collective bargaining rights to state employees. It was also the Democratic majority, led by then-governor Joe Manchin, that enacted corporate tax cuts a decade ago that currently cost the state an estimated $220 million a year in revenue, which would have been enough to give every public employee in the state a 12 percent raise. Those corporate tax cuts did not result in the private-sector job growth that was promised, but they’re a major reason why the state legislature now claims it can’t find the money to support public employees. Meanwhile, a 2018 candidate for WV House of Delegates, Lissa Lucas, made national headlines last month after she was removed from the House chamber for reading aloud how much money key delegates had taken from the natural gas industry. The story resulted in her raising over $45,000 for her campaign from grassroots contributions. The teachers, too, understand that the state’s politicians are prioritizing out-of-state interests over their own and letting the state’s natural resource wealth slip away to the benefit of an elite few. During the walkout, thousands of teachers flooded the state capitol with chants of “severance tax” and “tax our gas!” While the natural gas industry insists that an increase in the severance tax would “destroy the oil and gas industry,” independent estimates show that raising the natural gas severance tax from 5 percent to 7.5 percent would bring in an additional $93 million in the next fiscal year. Two months ago, it would have been impossible to imagine a political movement in West Virginia powerful enough to force a conversation about increasing taxes on the natural gas industry. It remains to be seen whether the teachers’ and public employees’ struggle, as a grassroots movement, will sustain itself beyond the strike to take political power in 2018 and beyond. Cathy Kunkel is an independent energy analyst based in Charleston, WV and co-chair of the West Virginia Working Families Party.